Flowers have inspired artists throughout time, irrespective of age, language or culture. Despite their ephemeral nature, they survive in memories as symbols of important events in our lives. Flowers appear in different forms and contexts, evoking emotional and esthetic responses, and express feelings that defy words. 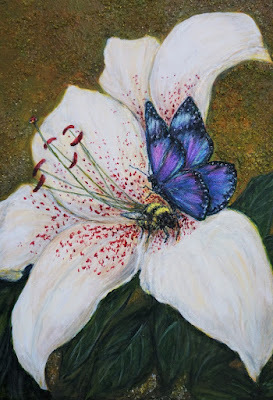 In this collection, Claire has painted flowers that represent significant moments in her life. The bees, butterflies and dragonflies serve as a reminder that although for us, flowers may be symbolic, they are essential to the survival of the natural world. 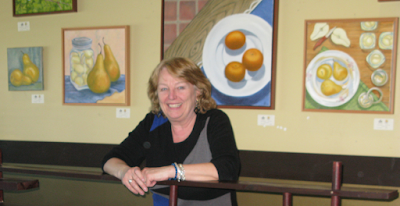 Pears are the featured subject for Arteast member Gwen Cowan in her exhibition at Luna Sole Restaurant. A life-long interest in art was first fostered in her upbringing, then in her education and on into her work life. For many years, Gwen worked in social services working with children of all ages. “My artistic training helped me a great deal in terms of what I could offer the youth I worked with,” she explains. She moved on from social work to picture framing then returned to helping school children develop their artistic interest and abilities. Luna Sole is located in the mall at Jeanne d’Arc Boulevard and Laverendrye Drive (opposite the Bob McQuarrie Centre) and is open every day for breakfast, lunch, dinner, and drinks. Registration can be done in person or online at http://join.ottawa.ca/. Announcing the Spring Break-a-Brush! Workshop Program - plein-air and studio! This Spring, we're looking forward to hosting another great workshop series: Over 6 workshops, we cover key painting subjects, walk with some incredible master painters and, with weather cooperating, some plein-air expeditions to boot! Inspired by Frank Carmichael and other members of the Group of Seven - sketching and painting expedition in the Canadian wilderness. The Spring Landscape - plein-air and studio! Develop your landscape drawing and painting confidence! Over the course of three workshops, we will cover sound practices as they apply to both plein-air and studio endeavours. These workshops will include optional plein-air sketching and painting expeditions at nearby scenic locations, with a return to the studio to create spectacular finished works. Explore creating vivid living compositions in dry media and paint and exploring people in real world situations as means of expression. Combinations of landscapes, figures and abstracted forms in modernist styles, inspired by the master Cézanne. 15,000 + donated books at bargain prices! Lots of books on art. Collectors’ table, DVDs, CDs and vinyl! Cash and cheques only please! AOE Arts Council is pleased to announce that we will be the beneficiary of a portion of Shepherd's Springtime in Paris event! Le Conseil des Arts AOE est ravi d’être le bénéficiaire d’une portion des fonds amassés lors de l’événement de Shepherd's Le printemps à Paris ! Vous êtes invités à assister.